Drama is all about understanding drama as an ‘art form’ and all the skills and techniques that will help you to learn your art. You will play many parts in different imaginary situations. You will have the opportunity to create your own work as well as look at plays written by other people. The Drama department at Christ’s is committed to delivering the highest quality of teaching and learning both in and outside of the classroom. It is our aim to deliver a curriculum that challenges all students and stretches the most practically able. This is supported by the variety of extra-curricular activities available. The department is led by Miss Harries and comprises two additional part time subject teachers. 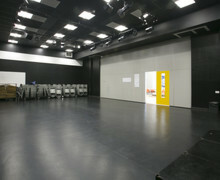 Drama is taught in two dedicated specialist spaces; the Drama Hall in the main building and in the Drama Studio in the Sixth Form Centre. We have very high expectations of all our students and challenge each of them to achieve their personal best. 90% of our students achieved A*- C grades in GCSE Drama last year. Building on the philosophy of the GCSE Syllabus, the emphasis is on Drama and Theatre Studies as a practical, intellectual and artistic subject. Students examine the use of theatrical forms and genre in relation to the exploration and performance of plays. Students develop an interest and enjoyment of Drama and theatre as participant and informed members of an audience fostering a critical appreciation of the subject. The students experience a range of opportunities to develop a variety of dramatic and theatrical skills. A monologue or duologue from one key extract from a different performance text.